Kate recently commissioned me to make her some space-themed beads, and my ‘night sky’ design was the result! Kate is an artist whose work I’ve admired for some time on social media - and when I saw the first beautiful bag that she’d embellished with one of the beads in question, well, how could I resist buying it for myself? Kate’s boutique, ‘Handmaiduns’, is inspired by sacred geometry and the cosmos. She works with clay and acrylics, and her diverse range of gorgeous and highly original work includes crystal grids, incense holders, clocks, clothing and more, all designed and made by herself. Each item is completely unique. Space-y tassel in all its glory. 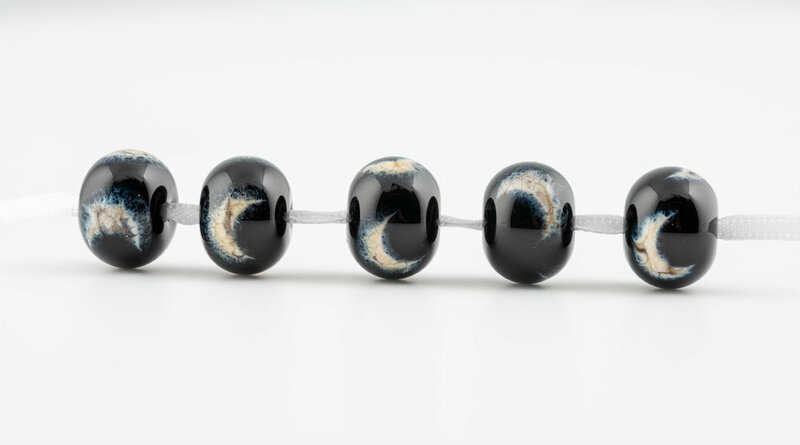 Here are the ‘night sky’ beads commissioned by Kate to use in embellishments for a range of bags she was designing. Here’s the finished bag - mine! What a beautifully packaged parcel! I was in such a hurry to open it that I didn’t snap it first - trust me, it was gorgeous even before this point! Here’s the bag - I love the moon bead at the top of the tassel, which itself tones beautifully with the bag. Hang on…. there was more! In a beautiful beribboned box painted with flames to match my logo, was this little guy…. …Hot Stuff! Thank you so much, Kate, for sending him to the Let Fire Inspire workshop. He’s feeling right at home already! What I love about making beads is that they might be destined for all sorts of uses! As charms, as jewellery components (pendants, necklaces, bracelets, earrings……), as integral parts of craft projects for grown-ups and children alike, as ‘pocketstones’, as talismen, as light-catching Christmas tree or window decorations… At home I have beads as light pulls and Venetian blind-cord pullers, and we have napkin rings made out of my beads, too. So they’re absolutely not just for jewellery. You can see from the pictures above that they also have life in outer space…………..!